Don't buy just any high-yield dividend stock. Here are three of the best. All high-yield dividend stocks aren't created equal. There are plenty of stocks available that sport above-average yields, but there aren't many that also feature a low risk of a dividend cut and the potential to grow the dividend over time. Buying a stock for the yield only to have the dividend slashed is no fun. We asked three of our contributors to each discuss a high-yield dividend stock that investors should consider buying in November. They came up with Kohl's (NYSE:KSS), GlaxoSmithKline (NYSE:GSK), and Energy Transfer Partners (NYSE:ETP). Here are the details. Tim Green: In all of retail, the department store sector may be the gloomiest. Finding a department store that isn't struggling to attract customers is tough. Macy's is shutting down a big fraction of its stores, the once-hot Nordstrom is suffering from falling comparable sales, and Kohl's is facing declining sales and slumping profits. The entire sector is drowning in pessimism, and I think that creates a buying opportunity. Kohl's is my favorite of the bunch, in part because only a small fraction of its stores are located in shopping malls. The company continues to generate plenty of cash despite a fairly prolonged earnings decline, fueling a 4.5% dividend yield and substantial share buybacks. Kohl's stock trades for around 11 times the company's earnings guidance. Of course, if earnings continue to decline, this low PE ratio doesn't mean much. But some progress is being made. During the second quarter, adjusted EPS jumped 14% year over year, driven by lower costs and plenty of share buybacks. Kohl's reports its third-quarter results on Nov. 10. I'm not expecting great news, but if Kohl's can report decent numbers and maintain profitability, that may convince the market that the company isn't in the kind of shape its bargain valuation suggests. 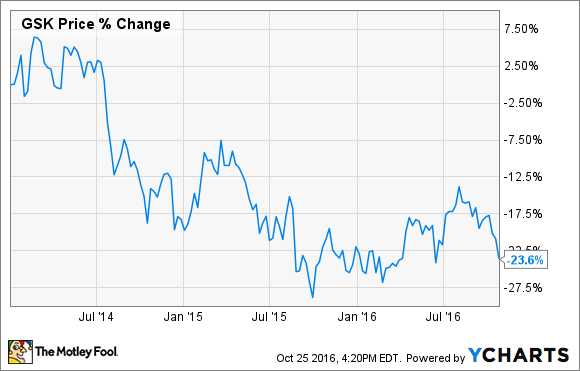 If you're looking for a cheap, high-dividend stock for November, and you're willing to be patient, look no further than Kohl's. Glaxo's faltering share price stems from a variety of factors, including several high-profile clinical failures, a pivot away from oncology to less-profitable vaccines, its bribery scandal in the all-important Chinese market, and perhaps most importantly, reimbursement issues surrounding the drugmaker's key respiratory franchise. Despite this laundry list of significant headwinds, Glaxo is actually a compelling buy right now, especially for investors looking for above-average opportunities on the dividend front. The heart of the matter is that Glaxo appears to have put most, if not all, of these problems behind it for the most part -- although the scandal in China is continuing to negatively impact its sales in that key emerging market. The drugmaker, for instance, recently filed a biologics license application with the Food and Drug Administration for its experimental shingle vaccine that could be its next blockbuster product. And its newer respiratory medicines like Anora Ellipta and Relvar/Breo Ellipta have started to gain traction commercially thanks to more favorable reimbursement terms from major payers. The key takeaway is that Glaxo is set to return to growth next year with a healthy 6.2% rise in its top line, perhaps indicating that the worst is finally behind this top pharma company. Matt DiLallo: With a current yield of 12%, midstream MLP Energy Transfer Partners unquestionably qualifies as a high-yield stock. However, as with most yields that high, there's a greater degree of risk. In Energy Transfer's case, the risk is whether or not the pipeline company can maintain its lofty payout through its currently ambitious growth phase. If it can, then investors buying today will be richly rewarded once those growth projects come online. On one hand, there are clear concerns surrounding Energy Transfer Partners' ability to maintain its lucrative distribution. First of all, the company paid out more than it brought in during the first two quarters of the year, averaging a 0.89 times coverage ratio. That's partially due to weakness in its midstream segment, which is feeling the impact of weak commodity prices. Further, the weak oil market is making it very tough for highly leveraged energy companies to raise capital at favorable rates. The tight financial markets could become a problem for Energy Transfer Partners because it has to fund the roughly $10 billion in growth projects it has under development. That said, its parent company, Energy Transfer Equity, is providing it with more than $1.1 billion of support by relinquishing an increasing amount of its incentive distribution rights. Meanwhile, Energy Transfer Partners continues to find innovative ways to access capital, including asset sales, joint ventures, and project-level financing. As a result, it remains on pace to bring a boatload of fee-based projects online over the next year. Those projects should significantly boost the company's cash flow and strengthen its ability to maintain, and possibly grow the payout. Energy Transfer Partners is not for the faint of heart. The company is walking a tightrope right now as it works to complete its major growth projects to boost cash flow. However, thanks to the support of Energy Transfer Equity, and its ability to creatively raise capital, the company has the capability to deliver an even more lucrative income stream to investors if everything goes according to plan.